Rediff.com » Business » Is the worst over for the economy? Is the worst over for the economy? "The Q1 numbers were good due to a satisfactory winter crop harvest; the monsoon shortfall is expected to affect summer crop production. "The residual impact of such a shortfall may well carry forward till Q3 2013"
There was a sense of relief when GDP numbers for Q1 2013 showed that growth had improved to 5.5 per cent. Q4 2012 GDP at 5.3 per cent was the lowest India had seen in years and the current marginal increase raised optimism that the economy has stopped decelerating for the first time in four quarters. There were apprehensions that if growth fell below five per cent, the fallout on sentiment would be worse. Though the slight improvement is comforting, it does not tell a story of economic rebound. 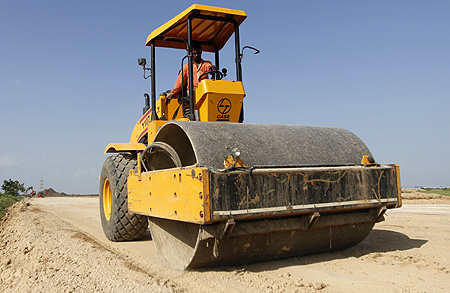 Image: A worker drives a road-roller during road construction near the proposed Ford car plant in Sanand. In fact, the individual components of gross domestic product tell a different story. Service sector growth, which had earlier held at over eight per cent, has steeply declined to 6.9 per cent driven partly by low transport sector output. Further, industrial activity has not picked up -- high capital goods variance with low mining and manufacturing is a continuing problem. On the positive side, agriculture has performed better than expected at 2.9 per cent. Where does this leave the economy? The reliability of Indian economic statistics has not been overtly high. Errors have occasionally surfaced, but directionally, the numbers haven't varied to a great extent. 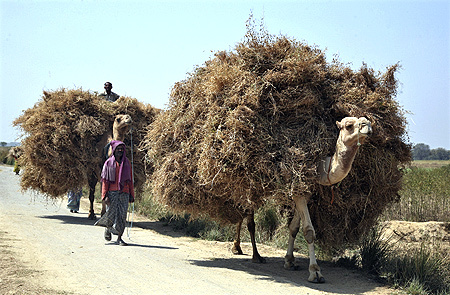 Image: Farmers transport wheat crop on camels at Pipalgaon village near Allahabad. Thus, any analysis of GDP by sectors should carry the caveat that the numbers are indicative. Although agricultural output has been better than expected, the performance of this sector is largely monsoon dependent. Overall, the monsoon shortfall till August had been 15 per cent with certain states like Punjab and Haryana receiving below average rainfall. Expansive irrigation projects may tide over this temporary problem, but the production of key crops such as coarse cereals and pulses has fallen. The Q1 numbers were good due to a satisfactory winter crop harvest; the monsoon shortfall is expected to affect summer crop production. 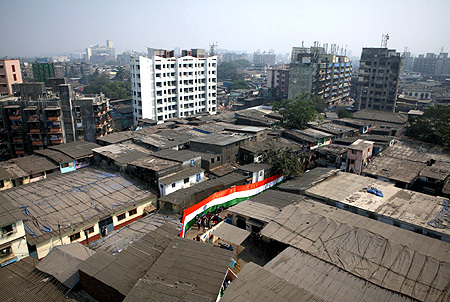 Image: An Indian national flag is pictured in a street in Dharavi, one of Asia's largest slums, in Mumbai. The residual impact of such a shortfall may well carry forward till Q3 2013, leading to an overall contraction in agricultural output. 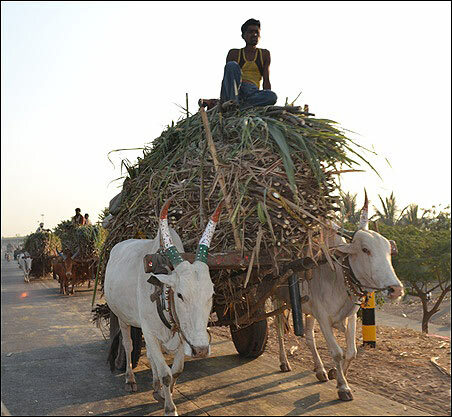 While the farm sector enjoys a 14 per cent weight in the economy, it has other linkages to overall macro-economic well-being. Any shortfall in output will affect food inflation and subsequently consumer demand. The summer harvest and subsequent rainfall pattern may eventually indicate how the sector will perform going forward. On the industry front, there are a number of issues facing economic recovery. 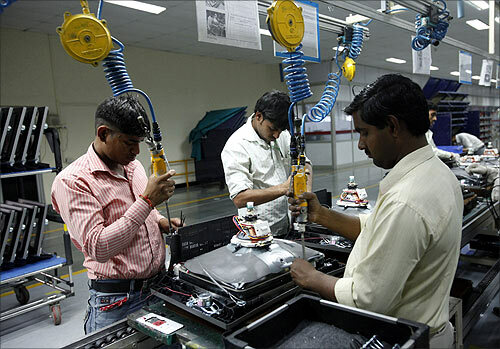 India's manufacturing sector grew at a 0.2 per cent during the quarter. Structural reforms, regulatory clearances and implementation of projects remain severe bottlenecks. 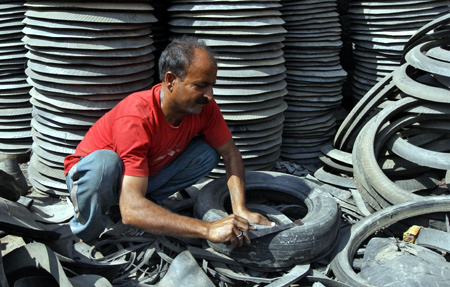 Image: A worker dismantles a worn-out rubber tyre for recycling at a workshop in Srinagar. 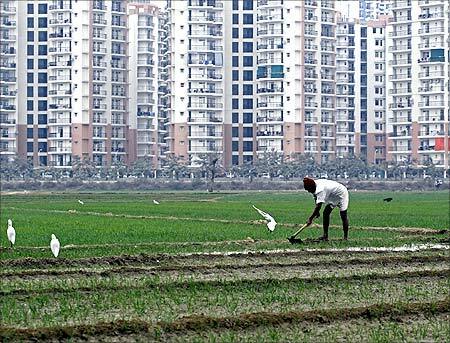 Infrastructure hurdles such as land acquisition and power reforms are acting as key impediments. The mining sector is suffering from scams and regulatory constraints, particularly on coal production. With linkages in power and manufacturing, the pace of growth in the coal sector is key for any future improvement in industrial growth. The situation is aggravated by a slowdown in exports and a resultant current account deficit. Though much of it is has been due to volatility in exchange rates and weak global demand, the timing couldn't have been worse. 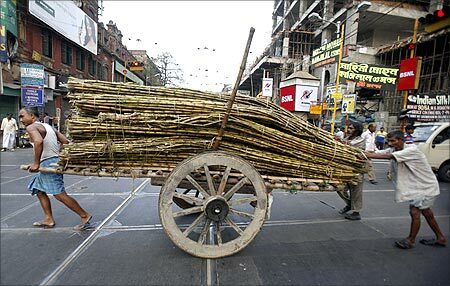 Image: Labourers transport sugarcane on a hand-cart outside a wholesale market in Kolkata. Weak demand has also affected capital formation. Low private investment sentiment has affected Gross Domestic Fixed Capital Formation that has fallen as a proportion of GDP from its highest level of 32.9 per cent in 2007-08 to 29.5 per cent in 2011-12. Without reforms, short- term improvement in the sector and improved performance during Q2 and Q3 2013 are unlikely. This brings us to the services sector. Growth, which had earlier held at over eight per cent, steeply declined to 6.9 per cent. Compared to above 10 per cent in Q1 2012, this is the lowest growth since 2009. While finance, insurance and real estate kept pace, low performers included sub-sectors like transport, trade, hotels and communications. The pace of decline is a key cause of worry. The service sector is the highest contributor to GDP and any decline in sub-sector growth is likely to affect GDP numbers sharply. 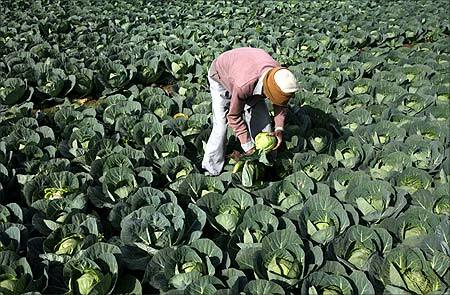 Image: A farmer works in his vegetable field in Jammu. Going forward, if agriculture contracts due to low summer output and timely industrial reforms are not implemented, a sub-seven per cent service sector output may well pull down the Q2 2013 number to five per cent. Other downside risks remain and inflation continues to be a problem, but structural reforms are imperative to get out of the low-growth trap. "The critical phase is the third and four quarters. Here, there is reason to be a little more sanguine. "The monsoon has finally not turned out to be as bad as was expected and the overall kharif numbers may not be too unsatisfactory". The latest GDP growth numbers -- to the extent that they do not change soon -- are mildly encouraging but are not strong enough to make us ecstatic. They are encouraging because after four successive declining quarterly growth rates, this mild increase comes as a breath of fresh air. The GDP internals reveal that growth is not really broad-based and that some of the sectors like construction or agriculture that did well this time may not repeat the performance over the next few quarters. The issue is whether or not growth has bottomed out and what this holds for the rest of the year. There is reason to believe that growth will be in the upward direction from now onwards, though the sectoral contribution will vary. The second quarter is typically a phase in which nothing really significant occurs. 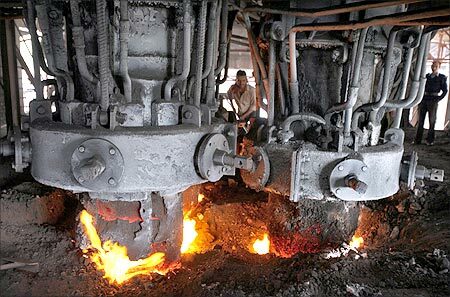 Image: An employee works inside a steel factory on the outskirts of Jammu. There is only residual farm production that comes in since the kharif and rabi are third and fourth quarter phenomena. 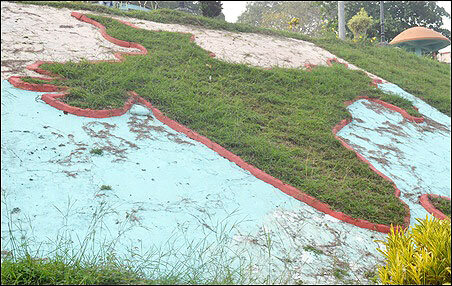 It is more horticulture, animal husbandry and so on that add to the numbers. Manufacturing chugs along. Construction activity slows once the monsoon sets in. The only major driving force is services, especially in the government sector that by virtue of a high fiscal deficit can provide a boost to the extent that it creates demand and does not just buffer costs as in the case of fuel subsidy. This is also the time when the National Rural Employment Guarantee Scheme is active. The critical phase is the third and four quarters. Here, there is reason to be a little more sanguine. The monsoon has finally not turned out to be as bad as was expected and the overall kharif numbers may not be too unsatisfactory. Add to this the fact that the late monsoon helps rabi sowing, and we could see some steady farm sector performance. Manufacturing would benefit more from the presence of the base effect in these two quarters in which growth was low last year. This, combined with a pick-up in consumer spending will help a bit. But overall growth may not go beyond the three-per cent mark by the end of the year. Construction would revive once the government expedites projects in the infrastructure space. The service sector will continue to be the mainstay and though the performance in Q1 was tardy with the trade and transport sector crawling, other components such as finance and administration have done better. With agriculture and manufacturing reviving, there will be a positive impetus to trade and transport that is based on production activity. Can something upset this story? The absence of a policy thrust is an issue for overall growth, and may not come too soon. But these conditions were anyway not present to begin with and our growth was based on other factors. The absence of government spending is a possibility, given it cuts back on project expenditure to rein in the deficit. This can push us back considering that private investment is not forthcoming. 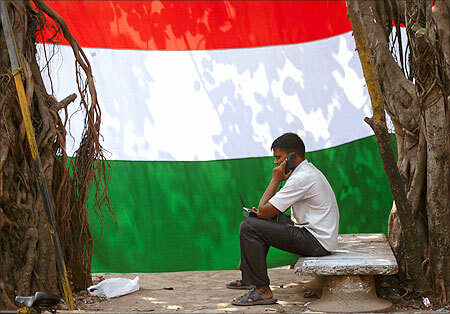 Image: A man speaks on the phone outside his shanty in front of an Indian national flag in Dharavi. On the positive side, the Reserve Bank of India could lower rates in the third and fourth quarters mainly owing to growth concerns as in April, though inflation will continue to be high in the food segment. No action from RBI can be a factor disrupting this story. Therefore, there is reason to believe that growth will climb upwards, albeit very gradually, and will be around six per cent for the year. The fact that everything that can go wrong has already been buffered is in a way positive. Can there be a hard slippage in any of these quarters? This cannot be ruled out in the second quarter but considering that most of the productive activity comes in the third and fourth quarters, it should not be interpreted as a fallback unless things go horribly wrong and growth slips below the psychological five-per cent mark. Though the bottoming-out theory will most probably hold, it does not mean we can gallop along at this rate without affirmative action on the policy front for too long. We can be lucky once more this year, with a lot of aid of the base effect, but we should not push our luck since moving to a higher growth trajectory cannot be achieved with status quo in the topography. There lies the rub. Image: Workers at LG Electronics India Pvt Ltd. assemble television sets inside a factory at Greater Noida. CRR row: RBI Governor doesn't see an end!